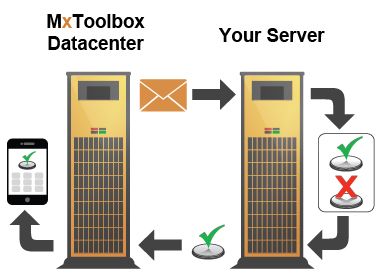 MxDelivery Center is your comprehensive service for understanding email that has been sent "From" your domain. Our Engineers built the MailFlow tool to go beyond just monitoring static SMTP availability. Even short email delays can be costly for your business. By sending a message through your server and back to our datacenter, we can provide complete mail flow visibility to uncover issues that might be creating delays as well as detecting both inbound or outbound mailflow failure. In addition to alerts for failure, you can login to see daily, weekly and/or monthly historical statistics. This method allows you to get a true picture of the performance of your mail-server. Web Server monitoring checks your website status every 15 minutes.